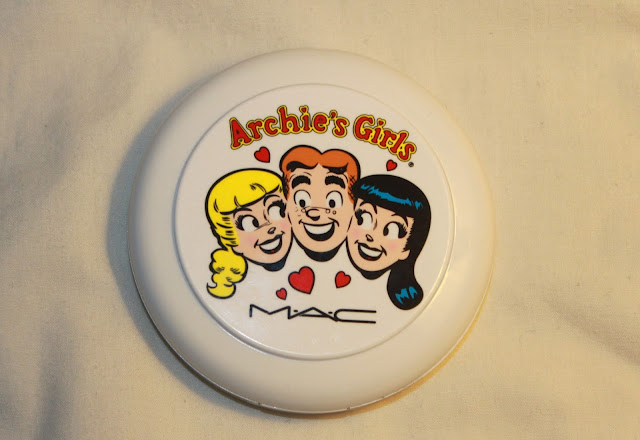 If you've read many posts on my blog you'll know that I've been loving Mac's Archie's Girls collection, and I've got a few bits from it. I've reviewed so far the Cream Soda blusher, Ronnie Red lipstick and I have yet to swatch Magic Spells pigment and Caramel Sundae Eyeshadow Palette. Now I'm reviewing one of two Pearlmatte Face Powders in Veronica's Blush, the other one is from the Betty side of the collection and is named Flatter Me, which I wished I'd picked up too! Veronica's Blush was hard to photograph due to it's subtly and shimmer. Firstly, the packaging is to die for. The iconic Archie's Girls white packaging and logo looks so cute, and to make things cuter the pan matches the packaging, with 3 larger pink hearts! The product itself has been a hit and miss for a lot of bloggers, and for me it's been a big hit. I think it depends on what you'd use it for and the colour skin you have. The main colour to this palette is a soft pink. Swatched by itself it has a gorgeous cream shimmer with pink tones to it as you can see below. I love this as a highlighter and usually use a brush, or my fingers, to apply this part under my brow bone or in the corner of my eyes, or even above my cheek bones. 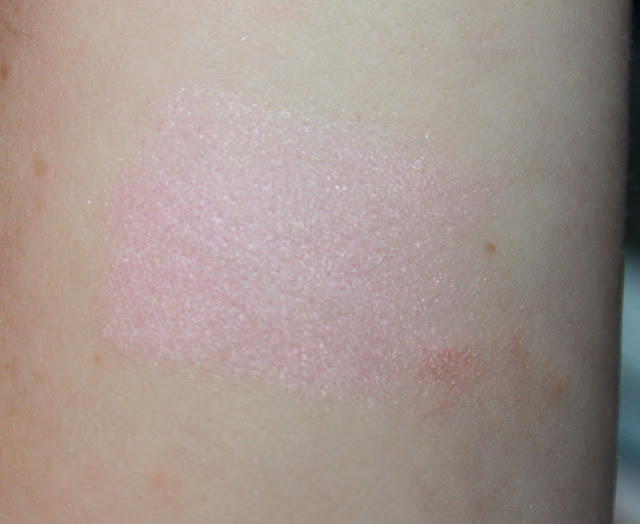 The pink hearts has little pigment as you can see below. On its own it almost has no colour, but as you can see in the final swatch it does have an impact when used as a whole. 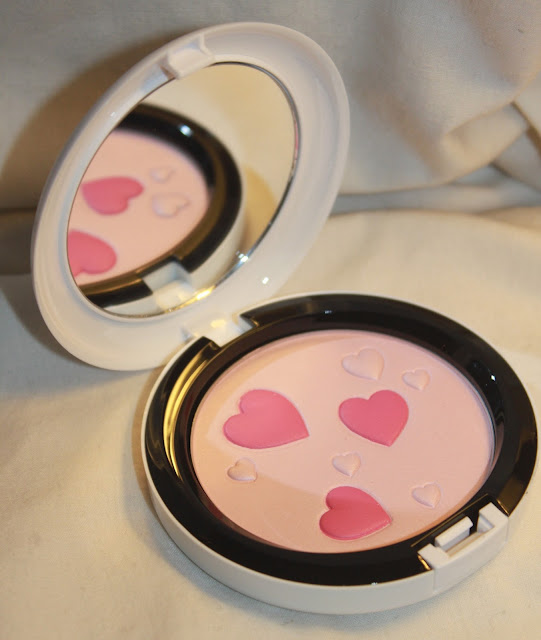 As a whole I can't really use it with any other blush as it gives my cheeks pink tint. I'll either use all the colours as a wash on the cheeks, or I'll use the pale pink as a high lighter above my blusher. This Pearlmatte Face Powder gives my cheeks a lovely glow and has lots of shimmer. I've noticed on some blogs that it doesn't show up, but on my pale complexion it looks really lovely. It catches the light effortlessly, and gives my skin a natural looking sheen. I can either use it subtly, or build up the colour. I picked this up at my Colchester Mac store, but I've seen it in some stores across England this week so you can still pick yours up before the sell out. Sold out online, so get it from your nearest Mac store for a £21.50 for 6g if they have it available. Do you like this Pearlmatte Face Powder? And did you purchase anything? 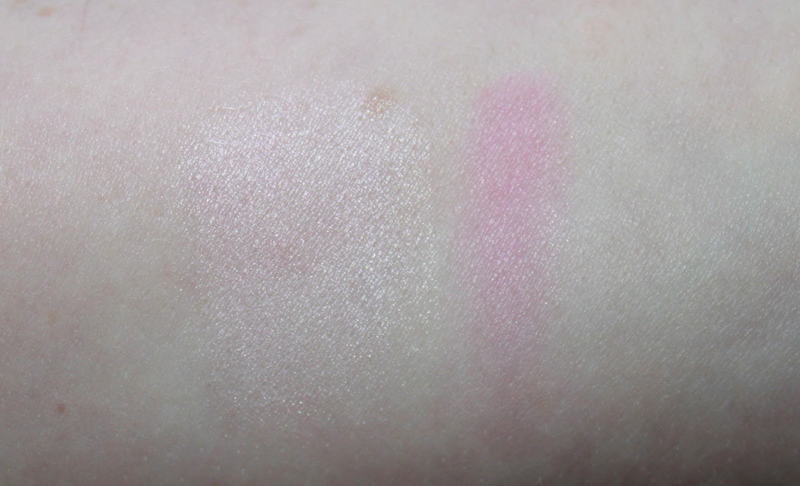 The main light pink swatched and the pink hearts swatched. Product as a whole, completely mixed. I think it looks absolutely stunning, love it! 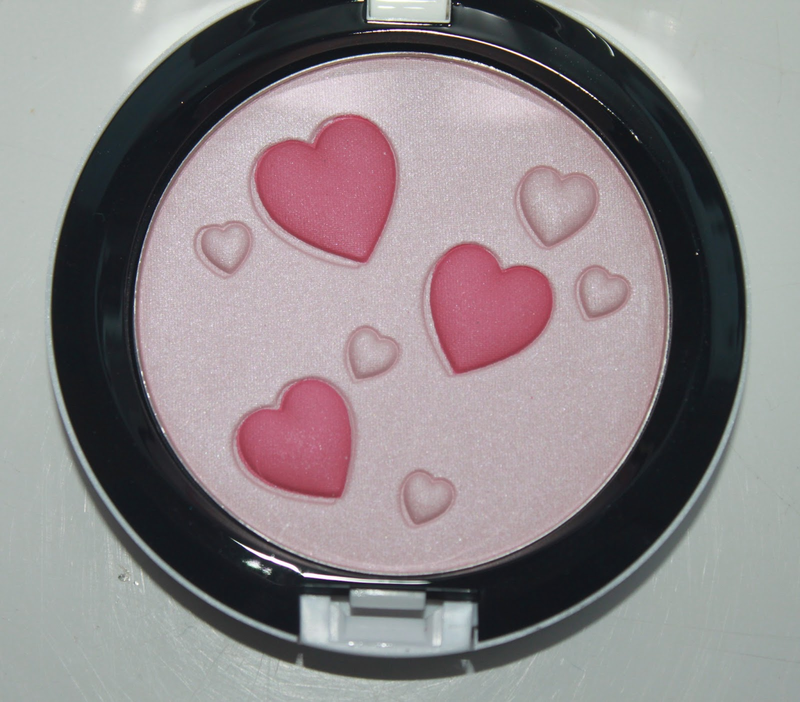 This blush is absolutely adorable! I'm so jealous! This blush looks so pretty. This is adorable! I can't get over how cute the actual packaging is on the inside and the outside. It's a great color also!